Adventures in cooking. Ok, first the disaster story, then the success story. This started with a cookie recipe I found at Bunny Pie's place. Being as it was the end of a perfect day, I was feeling rather adventurous and confident, and I wasn't really concentrating. I should have read the destructions more carefully. First I realized I had no oatmeal. But, I had some leftover cooked rice. Why not, says I. Never having tried rice in cookies, it seemed like it might be good, so I replaced the oatmeal with rice. Now, if you've never done this, let me tell you, don't bother. Maybe uncooked rice would work, I don't know, but rice doesn't continue to absorb moisture, and it doesn't stay soft. The resulting cookies were fine when they were just out of the oven and still soft and warm overall, but when they cooled, each little kernel of rice had cooked up into a tiny stone. Rock hard. Worse yet, instead of forming 1 inch balls, 3 inches apart, I formed 3 inch balls, 1 inch apart. This is a recipe that spreads. The result was one massive pan-cookie. I cut them apart with the knife and offered one to the hubs, who looked at me a little doubtfully. Then he bit down on a rice kernel. I'm not sure he'll eat my experimental cookies ever again. always keep your sense of humor handy (along with the number for the dentist). So, ok, back to the original recipe, this time with just a few small flavoring adjustments. SUCCESS! After these cool, I'm going to melt some chocolate and do a half dip, but I wanted to get this up and post it to the Carnival. I'll add the choco-pics later. Preheat oven to 350°. Mix butter, crisco and sugar together until light and fluffy. Add vanilla, orange shavings, and orange extract. In a separate bowl combine flour, salt and baking soda. Beat slowly in to wet mixture. Finally, add the oats. Plop 1 inch dollops onto a cookie sheet, about 3 inches apart. Bunny said to roll the dough, but my dough was too wet to roll. Cook for 10-12 minutes. 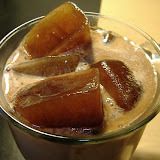 Let cool before eating. 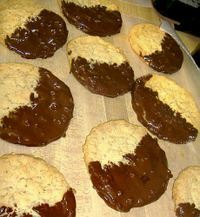 The cookies will be a little puffy when you take them out of the oven, but they flatten and get crispy after they cool. And they are DELISH! They'll be even better when dipped in chocolate. UPDATE: The cookies have been dipped, and are cooling/hardening as I type. I used a combination of milk and dark chocolate, plus about 3 ounces of a candy bar called Krackle. It's like a Nestle's Crunch, with little rice crisps in it. This will hopefully give the chocolate coating an interesting crunchy texture. (I'm almost too impatient to wait for the chocolate to harden, I want one NOW.) I also added a few drops of orange extract to the melted chocolate. UPDATE 2: The Carnival of the Recipes #80 is up at Sun Comprehending Glass! I also have used substitute ingredients a few times, with about the same and,worse results. So I did chuckle at your story. Being creative is fun, even if the results are not always what we hoped for.